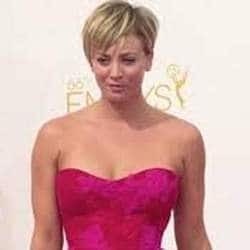 Kaley Christine Cuoco-Sweeting ( /ˈkeɪliː ˈkwoʊkoʊ/ kay-lee kwoh-koh) (born November 30, 1985) is an American actress, known for her roles as Bridget Hennessy in the ABC sitcom 8 Simple Rules (2002–2005), Billie Jenkins in the final season of the supernatural drama series Charmed (2005–2006), and Penny in the CBS comedy series The Big Bang Theory (2007–present) for which she won a Critics' Choice Television Award in 2013 and a People's Choice Award in 2014. Cuoco has also appeared in films such as To Be Fat like Me (2007), Hop (2011) and Authors Anonymous (2014). In October 2014, Cuoco was awarded a star on the Hollywood Walk of Fame.